In 1841 Don Raimundo Olivas and Felipe Lorenzana were granted more than 4,000 acres by Governor Juan B. Alvarado as payment for their service in the military of the Mexican Republic. In 1865, Lorenzana sold his half interest in "Rancho San Miguel," while Olivas retained the eastern half. As the Olivas family grew (there were eventually 21 children) additions were made to the little adobe they constructed in 1837. A large two story adobe was joined to the smaller adobe by an enclosing wall and the smaller adobe became living quarters for the Olivas family servants. The Olivas Adobe has been restored and includes its protective walls. The larger two story adobe homestead illustrates a blend of Mexican and early Spanish architectural elements. In 1963 it was purchased by the City of Ventura and included as the centerpiece of a park. The park includes exhibits, extensive gardens, and the restored adobe buildings. 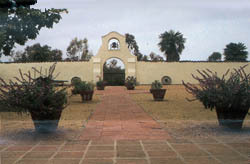 The Olivas Adobe is located at 4200 Olivas Park Dr. in Ventura. The grounds are open daily 10:00am to 4:00pm and the adobe is open on weekends 10:00am to 4:00pm For more information call 805-644-4346.